Athyrium filix-femina grows best in moist shaded sites with humus rich soils. This fern prospers in slightly acid to neutral soils and is intolerant of clay. Plants require high humidity and should be sheltered from wind. Short term drought can induce temporary dormancy but plants will generally return the following spring. This delicate looking beauty is easy to grow and low maintenance in shaded exposures with rich, loose and moist soil. Established plants are pest resistant. As they mature into lush groundcover stands they provide valuable habitat for small wildlife. LANDSCAPE USES: The dramatic feathery foliage of this fern make it a lovely and useful Accent for a Shade Garden. In appropriate sites, Athyrium filix-femina matures into a verdant and soothing Groundcover, Grouping or Mass. This fern is a valuable component of Low Maintenance Plantings, Perennial Borders, Water Gardens and Wildlife Gardens. 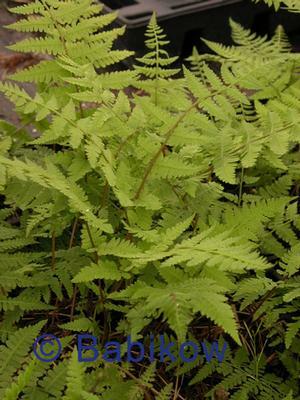 Athyrium filix-femina is a deciduous clumping perennial fern. Each spring, fronds emerge from sturdy green fiddleheads. The fiddleheads and the petioles that unfurl from them have brownish chaffy scales. Plants are upright or vase shaped. Slowly expand from rhizomes to form small colonies.